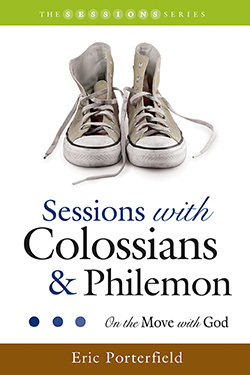 Sessions with Colossians and Philemon is a ten-session study unit designed to provide a compelling preview to these two of Paul’s letters. Each session is followed by a thought-provoking page of questions that allow for a deeper experience of the scriptural passages. These resource pages can be used by seminar leaders during preparation and group discussion, as well as in individual Bible study. Eric Porterfield takes readers on a journey through Paul’s letters to the Colossians and to Philemon. These letters celebrate the good news that God is on the move in the world through Jesus Christ, shaping the world into what it was created to be. This movement will one day be complete when Christ returns to fully establish the kingdom of God. Until that day we work for the kingdom, give witness to it, and invite others to enter it through faith in Christ. Paul’s letters equipped their original audiences and they equip us to be “on the move with God” as faithful kingdom workers. Eric Porterfield is married to the Rev. Alicia Davis Porterfield and they have three children, Davis, Luke, and Thomas. He is a graduate of Duke Divinity School and serves as the pastor of the Winter Park Baptist Church in Wilmington, North Carolina.